Bioabsorbable polymers have a range of uses in modern healthcare. Evonik looks at the growth of this material and its inclusion in life-saving products across the last 30 years. In the medical device area, bioresorbable polymers have been successfully applied for the past 30 years. They are derived from lactide, glycolide, trimethylene carbonate, p-dioxanone and ε-caprolactone to produce a variety of bioresorbable products, and have broad application in the medical field due to their mechanical and thermal properties. This allows processing with common production technologies such as extrusion, injection moulding and compression moulding. Being bioresorbable, a second surgical intervention is not needed for removal. In addition, they aid in the healing process by gradually transferring weight load or facilitating tissue regeneration as the implant degrades. In April 1966, Kulkarni et al. published the first significant report on the use of polylactic acid for medical purposes. The paper was the catalyst for the development of the polymer for human medicine after showing that polylactic acid (PLA) could be successfully implemented for sutures, vascular grafts and surgical implants. The study indicated that PLA was biodegradable, non-toxic, non-tissue reactive and would not be retained in any vital organs. The document explained that, through acid-catalysed homopolymerisation, a polymer resulted that could be cast into films, spun into fibers or used as coating. It also stated that the material would not elicit an immunological or inflammatory response and that degradation and elimination of the polymer was effected through the respiratory system. It was 20 years before the polymers became commercially available – the RESOMER brand of resorbable polymers was launched on the market in 1986 (first under the Boehringer Ingelheim label before its acquisition by Evonik in 2011). There was initial hesitancy of surgeons to use devices made from ‘plastics’ or to stray from conventional metal implants. Individual innovators led the way in working with biodegradable materials with some members of the surgical community requesting the development of biodegradable polymers with specific characteristics. This was the beginning of ‘on-demand’ polymer products, which still impacts the market today. In 1970 Davis & Geck launched the first bioresorbable sutures, Dexon. Due to their ability to reduce tissue drag, sutures derived from bioresorbable polymers are beneficial in the ophthalmic, cardiovascular and neurological application areas. Today metal screws are practically obsolete in the treatment of the anterior cruciate ligament (ACL) of the knee. Screws composed of bioabsorbable polymers have become widely implemented. Bioresorbable pins to fixate tissue and ligaments have been used since 1985, although exhibited rapid degradation rates. With the use of polylactic acid (PLA) degradation could be extended, sometimes up to several years. At that point, their application for slow-healing as well as fast-healing injuries could be justified. A turning point in the field occurred with the patent of the Polypin from Biovision in 1994. This offered a new pin design using poly(L-lactide-co-D,L-lactide) that was filled with an X-Ray contrast marker, enabling the implant to be exactly located in the body. Several manufacturers have looked into combining biodegradable polymers with inorganic substances, such as derivatives of calcium phosphate. The benefits of such composites are two-fold: they can withstand higher loads and provide enhanced biocompatibility. Arthrex’s BioComposite interference screw is 30% biphasic calcium phosphate and 70% PLDLA. Smith & Nephew offers the Biosure HA family of interference screws. These are made of polylactic acid combined with hydroxyapatite (HA), a calcium phosphate material. The company was the first to launch a composite implant in 2001, which was called the BioRCI-HA screw. 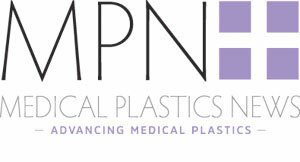 The use of bioresorbable polymers has transformed cosmetic surgery. Today it is possible to undergo a ’thread lift’ using degradable threads to lift sections of the face. This fast, non-surgical and non-invasive procedure does not require anaesthesia or a hospital stay. Bioresorbable wraps and sheets are extremely thin, transparent foils that hold tissue masses in place and facilitate post-surgery healing. Composed of biocompatible material, they are metabolised by the body and do not need to be removed during a later surgical intervention. One of the first companies to develop bioresorbable wraps was MacroPore, with its MacroPore OS protective sheet. Today the product is manufactured by MAST Biosurgery under the brand names SurgiWrap, CardioWrap and OrthoWrap. In 1998, the first bioresorbable stents were placed in human coronary arteries during a successful clinical study with Igaki-Tamai stents from the Igaki Medical Planning Company. This was a major breakthrough which led to more exploration into the use of bioresorbable stents. Another milestone occurred in 2011, when Abbott received a CE mark for the world’s first drug-eluting bioresorbable vascular scaffold (BVS) for treating coronary constriction. The device, called ABSORB, completely dissolves in approximately two years. Biodegradable stents allow blood vessels to reconstruct as the stent gradually disappears, offering a benefit over conventional stents. For the treatment of rotator cuff damage, there are several options for treatment, starting with pain medication and physiotherapy, and progressing to surgical treatment, such as tendon repair and other options. To assist with extreme cases, it is today possible to insert a biodegradable balloon (spacer) that helps prevent friction between structures in the shoulder and prevent pain associated with this type of friction. The balloons are made of biodegradable polymer and are positioned between the humerus head and the acromion. The InSpace was cleared for marketing in the EU (CE marked) in July 2010, and since then more than 10,000 surgeries have been performed using this device. The product is made of a copolymer of polylactide and ε-caprolactone that degrades over 12 months. Its aim is to decrease friction through cushioning, reducing pain and giving the shoulder time to rehabilitate through physiotherapy. Today, bioresorbable implants are available which contain an active pharmaceutical ingredient (API) that offers localised, controlled release directly to the affected area. The targeted location also makes it possible to lower the drug dose and therefore decrease potential side effects. This improves patient compliance as the drug is delivered without the need for the patient to remember to consume the medication. One example of a combination product is the CiproScrew from Bioretec, which was launched in 2010. It contains the antibiotic ciprofloxacin and is used to prevent implant-related infections in cases of bone fractures, bone grafts, osteotomies, arthrodesis and osteochondral fractures. Technologies for preparing biodegradable devices have been widely studied and proven. These include melt extrusion and injection moulding. There are, however, advanced technologies which show substantial enhancements over common techniques. One of those is the so-called bone welding technique, which has been applied by the KLS Martin Group with its SonicWeld Rx system. This is a novel way to perform osteosynthesis by combining resorbable implants with ultrasonic technology. Through the energy generated by the ultrasound waves, the surface of the implant liquefies, enabling deeper penetration into the spongiosa, which results in stronger bonding than with conventional techniques. In the dental area, 3D printing has already been established to produce temporary tooth implants or customised models to train surgeons for complex operations. While these have not yet been produced with biodegradable polymers, there is ongoing evaluation into the development of patient-specific biodegradable implants consisting of PCL (polycaprolactone) and PLGA. Improvements in biocompatibility and osteointegration will need to be studied using inorganic fillers such as beta-TCP (tricalcium phosphate), hydroxyapatite or bioglass that can be added during the printing process. Currently, the largest challenge to patient-specific implants is time, especially where it concerns trauma patients. The implant needs to be designed, printed, sterilised and controlled before implantation can take place. There is, therefore, a great need to standardise materials, processes and supply chains. Research is also ongoing into implants that can improve cell adhesion and the growth and function of tissue. In the foreseeable future, implants will contain tissue that has been grown onto a biodegradable scaffold in an external bio-reactor. In this way, biodegradable medical devices can improve the healing process and outcome. The polymer scaffolds can be combined with extracellular matrices such as collagen, oligosaccharides or other biologically active compounds. Scaffold design is an ongoing challenge, as the products need to provide enough support while but allow oxygen and nutrient supply to the tissue. To this end, biodegradable polymers such as polydioxanone and polyesteramide are being examined, as they show enhanced biocompatibility and mechanical properties. R.K. Kulkarni et al., Polylactic Acid for Surgical Implants, U.S. Army Medical Biomechanical Research Laboratory, Walter Reed Army Medical Center, April 1966. Y. Matsusue et. al., “In vitro and in vivo studies on bioabsorbable ultra-high strength poly (L-Iactide) rods,” Biomed Mater Res (1992): 26, 1553-1567.